Her full name is Li-Jung Chen. Li was born and grew up in Kaohsiung, Taiwan. She majored in aquaculture in Pingdong Agriculture College. After graduation, she joined a research team in water quality control in aquaculture environment at the Tungkang Marine Laboratory, a branch of the Taiwan Fisheries Research Institute. Eventually though, the laboratory director discovered that Li was a prize winning photographer and assigned her to the post of institutional photographer. Li married Lloyd and came to the US in 1990. In the following year the two together enrolled in a ceramic class taught by Pamela Kozmiska at the Leisure Connection at San Diego State University and began a long process of converting themselves from aqua culturists to potters. Li’s ceramic activities were interrupted two years later because of the birth of their son and it wasn’t until 2000 that Li resumed potting. 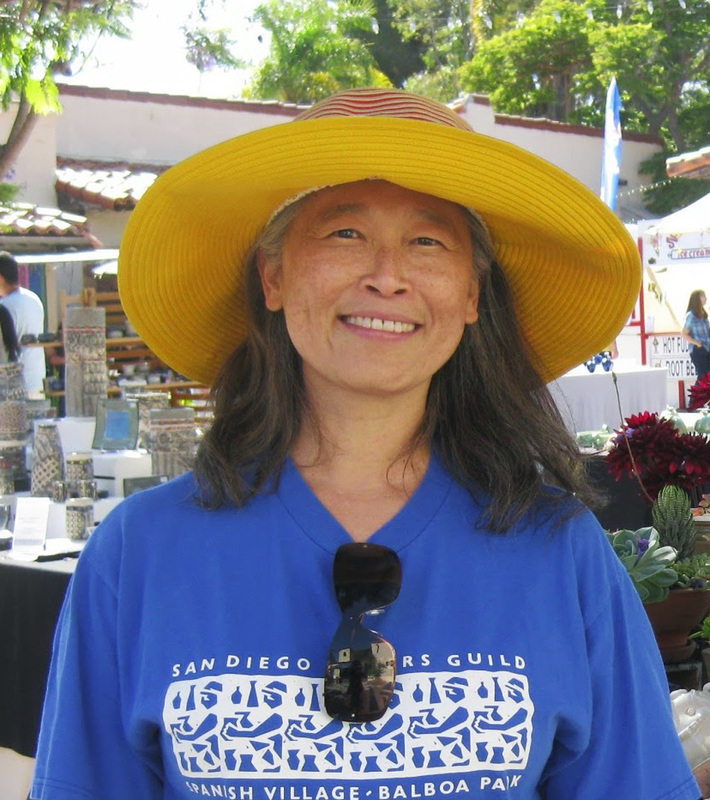 Since 2000, Li has taken numerous ceramic courses at San Diego Mesa College, under teachers including: Cara Mocqygemba, John Conrad, Lana Wilson, Patty Yockey and Brian Gillis. Li’s pots often are thrown and altered, with added on appendages and/or hand carving. She likes to enrich surface texture using rolled on or stamped pattern, carving, or forcing a wet leather hard pot from the inside outward to create cracking. She also experiments with glazes. Li does raku, saggar firing, but the majority of her pots are fired to cone 10 in gas or electric kilns. Li enjoys exploring new techniques and creating new surface pattern and forms. She would repeatedly make pots of certain type only for perfecting the technique of producing hat surface and/or form. Whenever she believes that she has mastered the technique, she will drift into the venture of another form/surface. Her pots are truly unique, and one of a kind things.